The last Bond movie I saw was “Quantum of Solace”, Daniel Craig’s second movie as James Bond. I didn’t like the movie “Quantum of Solace”, especially after stellar performance by Daniel in his debut as Bond – “Casino Royale”. The previous bond, Mr. Pierce Brosnan did a fantastic job as Bond; well not quite as fantastic as Roger Moore, Sean Connery or for that matter Daniel Craig. Daniel Craig is a superb actor to portray Bond – both physically and acting wise. No doubt about that. 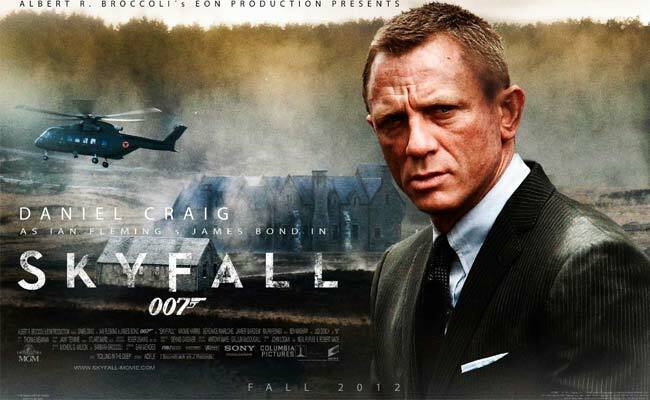 The recent flick of Daniel – “Skyfall”, was hyped since its first promo hit the market. I didn’t use the word “over-hyped”, just to be clear. The promos looked promising and generated the enough curiosity in the Bond lovers. It was stated on various fronts that “Skyfall” is by far THE best Bond movie, ever. Well, I beg to differ on that statement. Skyfall has a human touch – Agreed. Minimum use of “gadgets” has made the movie “humane”; And I think this was needed and appreciated. Overuse of gadgets and extremely unimaginative stunts have made a mess of some of the previous Bond flicks like “Die Another Day” or “The World Is Not Enough”. Some of the scenes in both the movies seems a bit too far-fetched and gadget-dependent. Similarly, I couldn’t quite understand the plot and motive behind making “Quantum of Solace”. Not that the movie was too hopeless, but I didn’t find it too charming a Bond flick. But “Skyfall” is a good break after Quantum of Solace, in fact a much needed one. 1. When we get a little cocky about ourselves and the surroundings, when we are not very much sure about ourselves, we tend to act much more humane. A little element of doubt, makes us humane. 2. We need to have faith in ourselves and others. Even if someone has failed, has not lived up to expectations, we should not judge him/her and brand him/her invalid and useless. Give the other person another chance and have faith in that person and see the good results. There are some of the lacunae in the movie “Skyfall”, but I guess we can let go of some of them. The focus of the movie is on relationship of James Bond and his mentor M, and the movie has done justice with that subject. The plot is good and picturization is nice too. Some of the stunts are impeccable and immaculate, especially the bike stunt over the roofs of local bazaar and the one where Bond joins two rail coaches by a hoe. The movie spans for 140 minutes and is a bit slow at some points. But the movie never leaves the plot or wanders anywhere. The movie doesn’t inflict boredom and that’s another plus point. Of course a Bond flick doesn’t need any other positive attribute attached to it to make it an amazing watch. GO WATCH IT. THE SKYFALL.